© 23 March 2001, Carolyn Smith-Kizer, Dialogue - Old Fort Niagara, New York. The late 16th-Century found Europe in flux: with the economic collapse following the destruction of the Spanish Armada, and with Elizabeth having to balance Puritan and Papal influence on that across-the-channel island, Paris and its royal court became the repository of high culture for the Western World, so much so that a century and change later--after Calvinism and Catholicism intellectually leveled each other following Charles II's return to the Pretender's offshore island in 1660–Russia's Peter thought of Paris as the cultural center of world. But culture in France's rural regions and in her colonies followed a principle that has best been described in linguistics: the farther away from a cultural center a person travels, the greater the solidification of language and culture, meaning that the language and culture a person possesses when journeying into the hinterland will resist change and will be retained for far longer than at the center. Perhaps the best example of this is the language of Iceland, where Old Norse was codified as if written on stone tablets. As applied to habitants of Nouvelle France, the housing designs and furniture styles that were brought from the Continent were perpetuated for generations rather than changing to reflect the ebb and flow of high culture, the phrase a catch-all for the fashion and philosophy for the period's trendsetters. The changes in housing designs that occurred in Nouvelle France were climatic adaptations reflecting the availability of local building materials rather than changes stemming from cultural waffling between Platonic inspiration (as exemplified by Locke and later Rousseau) and Aristotlean classification (as exemplified by the Age of Enlightenment and later Kant). The influence of Platonic and Aristotlean thought on high culture was enormous. In an overly simplified sense, Platonic thought elevates curves, nature and artistic inspiration--those things that are often regarded as feminine--while Aristotlean values are reflected in form, structure, straight lines, mathematical logic, and the teachings of Saint Augustine. It was principally Aristotlean values that habitants took with them to Nouvelle France. These values caused habitants to paint their furniture and to plaster their houses. Raw nature was to them a sign of poverty. The change first made was steeply pitched roofs. As an overview to housing design in Nouvelle France, three regions existed: Canada, Illinois, and Louisiane. In each of these three regions, roof lines or styles were the most distinguishing climatic adaptation. In Canada, roofs were steeply pitched (55 degrees from horizontal) to sluff-off snow. Eves were reduced to give less area for ice buildup, which causes melted snow to puddle until finding a hole in which to penetrate the living space. In Illinois and Louisiane, snow wasn't the problem. Rain and humid heat were. Roof pitches more closely reflected those in France while wide, shed-roofed galleries were added. These galleries kept the rain well away from the walls of the house while also providing shade for the walls. Gaps between the tops of the attic walls and the undersides of these wide, overhanging roofs produced venturies which might have been helpful in cooling the houses if the habitants could stand the stuffiness of not having open windows or doors. In addition, in Louisiane the bottom floors of houses were elevated so air could flow beneath the houses to help cool them and to reduce the moisture that would otherwise quickly rot sills and floor joists. Louisiane’s best colonial housing is reflected in the lovely plantations along the bayous. The heavy timbers and beams used in all three locations provided heat sinks that helped make these houses habitable. The wood absorbed heat all day and gave it off at night, thereby moderating inside temperatures. In the North, that heat was from the fireplace. In the South, that heat was the mugginess of summer. Habitants to Nouvelle France brought with them housing designs from their native regions. Most habitants to Nouvelle France (Canada) came from the regions of Normandy, Brittany, 0the Perigord and Dordogne (Moogk 1977:22). These are rural regions, with Normandy (citing the earlier mentioned principle of cultural solidification) retaining the housing designs of its Danish ancestry, that Viking long house design reflected in their cavernous farmhouses which had been adapted to the region's shortage of timber. Thus, habitants from Normandy built houses in Canada like those in Normandy which are like those in most of Danish-influenced Europe, their design being somewhat similar to the Iroquois Confederacy's "longhouse." Whether the house was constructed of timber in poteaux en terre [posts in the ground] or poteaux en sol [posts mortised in a sill timber] filled in with colombage pierroté (stone and mortar) or colombage bousillé (a cheaper fill of crushed stone, shells, or moss and mud), the house was basically longer than wide by the ratio of 2-to-1 with either a central fireplace or with a fireplace at each end of the structure, and with no partitioning inside. This architectural style was known in France as "Norman half-timbered," and it was similar in feel to the palatial stone halls of the aristocracy. But the large, open expanse was difficult to heat in France, and nearly impossible to heat in Nouvelle France. 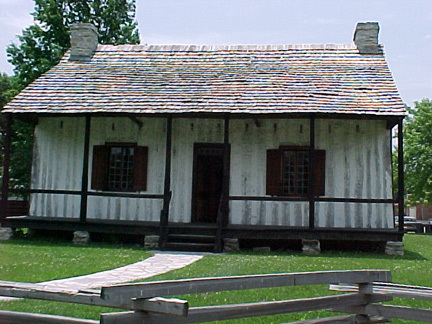 The first habitants to arrive in Nouvelle France built nearly exact copies of houses in their native regions, but within a generation the abundance of locally available timber produced a distinctively Canadian style: pieces-sur-pieces, or upright posts grooved to receive short, horizontally-laid timbers, a style that would later be known as "Red River Frame." This fully timbered house resulted in superior insulation against the long, cold Canadian winters. "[Red River frame construction had its origins both in Europe and New France. It evolved from a half-timber house which had wooden verticals fairly close together and the space between filled with mortar and stones. This fared poorly and the mortar and stones were replaced with horizontal wooden inserts which were not water tight and shrank and warped over time. The solution was to have the short horizontal tongue and grooved into the vertical studs. A harder, water resistant wood was used as a base sill. No nails were used on these interlocking joints with wooden pegs as anchors. Wood was abundant, as the river banks were bordered by maple, elm, oak, and pine. The roofs were thatched with hay from the plains and mud from the river bank. The river mud was used for making plaster, finishing chimneys and fireplaces. Dividing walls could be made of poplar trunks, lathwork and plaster.] But its primary advantage was that "a single man with a few portable tools could do most of the work of building himself" (Moogk :34) and it appears that this style continued on into the Mid-Continent with the habitants as they settled in the Pays Illinois (see plan and elevation of Red River Frame LePage House noted in Prairie du Pont, IL, by the WPA and diagramed in [Walthall 1991:120] prior to its demolition in 1972). In addition, in Illinois, poteaux en sol construction was retained until some time after American possession of the territory. If roofs were not of thatch, they were most often overlapping boards on top of a layer of tongue-in-groove boards laid on top of the rafters. 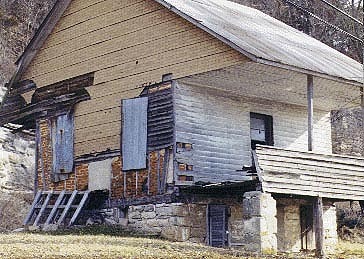 This technique also aided in keeping out the wind and weather; later shingles replaced thatch. However, shingles were soon banned in the cities of Nouvelle France because they proved such a fire hazard. Stone gables were required between townhouses and ladders were attached to roofs to aid firefighting. "The attic story may have provided additional living space . . . a knee wall at least two pieds (French foot measurement) high above the second floor ceiling joists allows for large, usable attics . . . if it were too cold up there in winter for the owner, it was deemed sufficiently warm for children or servants (Moogk: 27)" (See Figure 7-13. Pierre Martin/Nicholas Boismenue House in Prairie du Pont, constructed in ca. 1790 [Walthall: 116]. Restoration of the Martin/Boismenue House now employs venturies and open attic space to facilitate heat loss in the humid American Bottom). 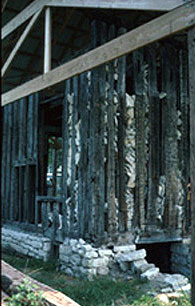 Regardless of construction technique, Canadians smeared a covering of lime or whitewash over roughcast mortar and timbers, effectively masking the materials used--colombage, stone, or timber. "The people of the period did not value a look of raw wood or stone--just as they did not accept the appearance of a natural wood finish on furniture. . . . The lack of paint or whitewashed plaster was a sign of poverty, which even the poorest habitant found unacceptable. Under no circumstances would they have incised the joints between stones . . . that procedure would have accelerated the destruction of the wall and soft-lime mortar by water and frost (Moogk: 95)." As most of the habitants came to Canada prior to 1700, they brought with them in their resettlement throughout Nouvelle France the large open room, or two rooms with a few furniture items to relieve its starkness. When the Sun King’s influence on architecture and furnishing began to wane, it was accompanied by a change in manners . . . "People want their ease and comforts, to suffer less from cold, to be able to seclude themselves from their train of domestics and from troublesome outsiders, to be able to go conveniently from one part of the house to another, to find at meal times their table prepared in a room devoted to the purpose (de Félice II 1920:23). Clients no longer demanded from their builder a large hall with portable partitions or screens, but begin to install permanent partitions, and, therefore, separate rooms are set apart for specific purposes--bedrooms, common rooms or parlors with separate entrances, and other rooms as the wealth of the family allowed. This adaptation was followed in Nouvelle France, as well, and the majority of houses now include a kitchen--dining room, parlor and a separate bedroom for the master; children normally slept upstairs in the attic. Residents of palaces and large farmhouses utilized screens to partition smaller spaces or "rooms," especially in front of fireplaces. The screen would reflect back the heat of the fireplace and keep the sitter somewhat cozy "Two folding screens, each of six "doors," of red serge with gilt nails, struggle as best they can against the draughts;" (de Félice II 1920: xix) See screens near fireplace. In the beginning the cavernous dwellings seldom had partitions, other than a small corner turned into a closet (laiterie) for the chamber pot (Lessard and Marquis 1972:222). All family activities took place in the common room, which in the early days of the colony occupied the whole of the ground floor. Bedrooms, spaces like the cabinets in palaces, were made by the construction of pinewood partitions at the end of the 17thCentury, and the parlor was partitioned off from the common room at the end of the 18thCentury. The bed, if not the lit close or closet bed, was literally surrounded and topped with great swaths of curtains and canopies, and became a "tent" within the large rooms. Both the closet bed and curtained bed could be warmed by "body" heat. In the "state" bed, the King or noble could cavort or command with complete privacy while ensconced in the bed in the middle of a room full of people. "The joiner is to plane the underside of three ceiling joists and their bearers (palatrage) as well as the window sills, [he will also provide] two wall cupboards, fully jointed and on either side of the fireplace, two cornices above the hearths, a table with turned legs . . . , the frame of an armchair with turned legs but without upholstery (Palardy 1963: plate 304 & 306), and a sideboard built into the wall (Moogk: 106). This list was a habitant’s rendition of a current French interior—"for the big pieces of furniture there should be one or two cupboards, but preferably Louis XIII pieces in two parts (chest or commode with upper part, possibly a commode with dresser or "hutch" with a pediment; in upholsterers’ parlance, they "are more drawing—room" than the Louis XIV cupboards; then two under-cupboards or commodes, forming a pair as nearly as possible—we must never forget that symmetry is a cardinal law of the style (deFélice II:141). The furniture style most prevalent in Nouvelle France is Louis XIII with its straight lines and heavily carved diamond-patterned motifs and most always a coat of paint. As Moogk correctly interprets, habitants who came early to the colony and who often had no contact with the mother country again in their lifetime did not appreciate a woodgrain finish, but preferred to cover cupboards, beds, commodes, moldings, paneling, chairs and tables with a coat of paint—red, black, blue, or green--as they had done prior to embarkation. However, they did receive influxes now and then of new colonists, who brought with them the au current styles. As a result, one sees sometimes-curious combinations of old and new styles—straight and imposing Louis XIII pediments and diamonds within the gracefully carved paneled front of an armoire that also exhibits the influence of Louis XV (Palardy: 50, item description of plate 35). If one peers closely enough, the sign of old paint is often in the carved detailing of many old pieces. This sparse interior is reflected most nearly in the web site pictures, printed pictures, and descriptions of eyewitnesses quoted in various journals, letters, and books. 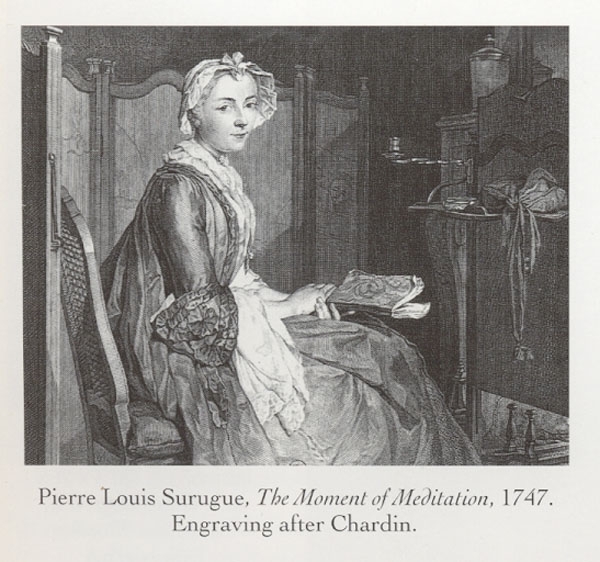 Chardin’s paintings (Grace Before a Meal) continually portray a tall-backed upholstered chair in red and green striped moquette, the epitome of Louis XIV/Regence design. The high back and regal scale of this chair was copied, more or less successfully, throughout Nouvelle France and examples of it can be seen in many reconstructions of interiors on the web, in books, and in museums, in Canada, Illinois, and Louisiane, both as armchairs fauteuil of upholstery (deFélice II:figs. 67 and 68), or, more often, as molded square outlined empty-holed chair backs (Palardy:plate 272). Another chair from this era that is still in continuous production is the armchair with cane, rush or leather woven seat and tall ladder back whose rungs are most often depicted as a double curve known as the salamander shape—the chair was called a capucine (deFélice II:fig. 86 and ). "Glass was never manufactured in Nouvelle France; it had to be imported (Moogk:46)." Most glass panes came from New England where the shearing process of panes from a block of glass still shows in the vertical striations within the small panes. As glass settles with age, it will acquire horizontal ripples—the vertical ripples or striations stem from its manufacture. Prior to 1704 the manufacture of textiles in Canada was forbidden. From that date, weavers were brought from France to instruct the young people of the villages in the craft, and looms also had to be imported as no one made them in Canada. These crude materials could not replace the fine stuffs imported from France however, and the habitants found they could buy materials much more cheaply in the English American colonies. "English materials were smuggled across the border in such quantities in the 18thCentury that Louis XV ordered a search of all the houses in Montreal in 1731 and imposed a fine on any contraband goods which were found—only fifty-three families escaped payment of a fine (Palardy:363)." French settlements in the Louisbourg and Acadia had access to English ships carrying goods directly from England. Even though French faience and English pottery sherds do appear in French colonial sites in Illinois and Minnesota, it would have been harder for these same settlements to obtain goods from France via New Orleans and the Mississippi River or Canada via inland water routes—trips down stream from Prairie du Rocher with a load of flour might take only a month—but the return trip upriver could take as long as four to six months (Belting 1948:64). Today sometimes one is lucky to be across the street from "just an old house" being demolished and to see, as the inner structures appear, solid black walnut hand-hewn timbers and to be able to put together a coalition to save and restore such colonial housing. Others own such wonderful treasures and choose to let them lie derelict. For a treasury of French Canadian housing photos scroll through the Ramsey Traquair Collection. Balesi, Charles J.1992 The Time of the French in the Heart of North America, 1673-1818. Sheffield Press, Hammond, Indiana. Belting, Nathalie M. 1948 Kaskaskia Under the French Regime. Illinois Studies in the Social Sciences 29(3). University of Illinois, Urbana. Brain, Jeffrey P. 1979 Tunica Treasure. Papers of the Peabody Museum of Archaeology and Ethnology, No. 71. Harvard University, Cambridge. DeFélice, Roger. 1920 Little Illustrated Books on French Furniture II: French Furniture Under Louis XIV. Translated by F. M. Atkinson. Frederick A. Stokes Company, New York. DeFélice, Roger. 1920 Little Illustrated Books on French Furniture III: French Furniture Under Louis XV. Translated by Florence Simmonds. William Heinemann, London. Lessard, Michel and Marquis, Huguette. 1972 Encyclopédie de la Maison Québécoise: 3 Siécles d’Habitations. Les Éditions de l"Homme Ltée, Ottawa. McDermott, John Francis. 1969 Frenchmen and French Ways in the Mississippi Valley. University of Illinois Press, Urbana, Illinois. Moogk, Peter N. 1977	Building a House in New France: An Account of the Perplexities of Client and Craftsmen in Early Canada. McClennand and Stewart Limited: Toronto, Ontario. Palardy, Jean. 1963 The Early Furniture of French Canada. MacMillan of Canada, Toronto, Ontario. Walthall, John A. 1991 French Colonial Archaeology: The Illinois Country and the Western Great Lakes. University of Illinois Press, Urbana, Illinois.